Baghdad Chamber of Commerce stressed on Monday the need to increase trade cooperation between Iraq and Jordan in various fields, at the top of which is to raise the level of entry for Iraqi traders, in turn between the Jordanian side and in an official visit to Iraq that their presence will enhance the understandings and trade agreements between the two countries. During the reception of the Jordanian government delegation headed by the Minister of Industry, Trade and Supply Tariq al-Hamouri and the membership of a number of Jordanian economic and trade figures, the head of the Baghdad Chamber of Commerce Jafar al-Hamdani said that the recovery of the Iraqi economy is positive for the economies of the region and the world, This is what all the economies of the world have realized. "The aspiration of the Baghdad Chamber of Commerce is that the brotherly Jordanian delegation would be a real breakthrough for the achievement of the Arab Union, the Arab Free Market and the strategic partnership." Al-Hamdani stressed the importance of discussing the files that enhance the reality of economic cooperation and transferring it to a new stage, stressing the need for both sides to facilitate and free the movement of goods and funds between the two countries, on top of which is facilitating the task of lifting the entry visa for traders between the two sides. The two countries. 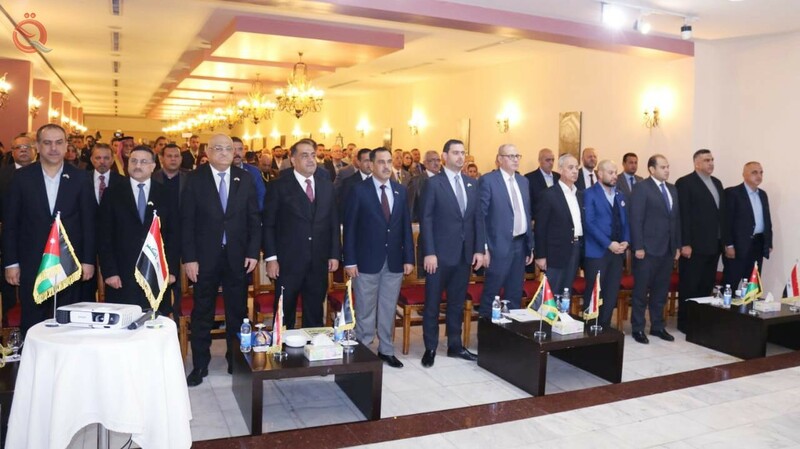 For his part, Minister of Commerce Mohammed Hashim al-Ani, said that Jordanian companies have many commercial opportunities available in all of Iraq can be invested and work on them, stressing the readiness of the ministry to overcome all the difficulties that may face those companies. He pointed out that Iraq is a global trade destination due to its commercial opportunities that can boost the economic balance, especially as the government program encourages investment and supporting the private sector. The Minister of Industry and Aid Saleh al-Jubouri said that the Jordanian industrial sector is a real partner in the Iraqi market and the possibility of supporting the Iraqi industry in joint cooperation are ongoing understandings between the two sides, stressing that the Iraqi industry is trying today to compete with its counterparts from the countries of the region by offering products according to approved specifications. His call for the need to support the Iraqi industry by placing it in the priorities of the Iraqi government's work. The Jordanian Minister of Industry and Trade Tariq Hamouri also stressed during his speech the importance of the presence of the delegation of the Hashemite Kingdom of Jordan in Iraq because of its positive repercussions at various levels of the two countries. He pointed out that there is a Jordanian trade delegation accompanying the government delegation, To promote mutual cooperation and benefit the two countries by studying the investment and trade opportunities of both parties.